Our guru rating has probably caught you off guard. Don’t freak out. This iSUP wasn’t released a year ago, it’s literally a newborn birthed into the SUP market. But, we couldn’t wait to give it a few digs. One aspect that caught our eye, other than the fact that it’s a kid-specific SUP, is that it can be a custom-made board. The iSUPs come in solid plain colors: blue, green, orange, and red. However, ibigbean allows for custom-made skins derived from your logo, sketch, or picture to individualize the board. The iSUP itself is made out of PVC with hi pressure double wall drop stitch construction. While it’s lightweight at only 22 pounds, it’s tough enough to tote 176 pounds of young kiddos on board or one adorable, chubby child. The simple board has on-deck storage, a non-slip EVA foam pad, and a tri fin thruster setup. To truly appreciate the value in this iSUP, you need to know it comes as an entire and complete package with everything you need. If you act fast, you can get free shipping. This might make all the difference when you find out where it’s coming from! The ibigbean iSUP is great for small paddlers of all shapes and heights. It’s easy to paddle, can carry 176 pounds, and the kids will love the bright, solid colors. It will really shine on flat water where the kids can paddle and stay within sight. For kiddos a little braver and with a parent nearby, small swells at the beach might prove to be addictive. This iSUP is so brand new that the SUP community is still quiet on the ibigbean brand and products. But, we’re not afraid to delve right in and give it an inspection according to our guru standards. We’re pretty sure that consumers are going to be attracted to the custom option. Things like cute quotes, family names, and logos are all the rave when customizing SUPs. 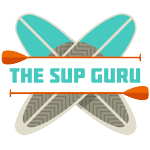 The low price tag on the SUP is going to be like nectar to bees. People will be willing to spend a few hundred bucks to get their kids a SUP that performs just like others in the market. The only thing that might not be so popular is that the company is based in China. Disregarding the controversial issues around “made in China” products, the issue of shipping fees, warranty claims, and quality control factors might prove to be a deterrent. How Long is the Warranty Period on the iSUP? The Company, ibigbean, offers a 1-year warranty. Shipping damaged parts can pose an issue to overseas suppliers, so the company ensures quality control is strictly regulated. They also include a repair kit for any unforeseen damage. They will also provide free repair kits for the lifetime of ownership of the iSUP. Who might Consider the China-based iSUP? Consumers who are looking for an iSUP with an unbeatable price will be attracted to the ibigbean kids paddle board. Also, the company offers international shipping which is a major benefit. Many SUP companies can’t ship out of the USA. Some countries don’t have access to SUP retailers when it comes to a brand they want to do business with. Do the ibigbean iSUPs Meet CE/UL Requirements? The company says they can offer the CE mark and UL listing mark certifications according to country when requested. How long has ibigbean been in the Inflatable Business? They have been providing what they claim as the world’s highest quality AirProducts for eight years. They provide all types of inflatable products worldwide. What is the best way to Contact the Company? International consumer relations is a very important aspect for ibigbean, and they pride themselves in superior customer service. The best way to contact them for free is via email. They respond within 24 hours. The paddle is made out of aluminum and is unlikely to float. It’s adjustable from 32-82 inches. What is Included in the Complete Accessories Package? While online pictures of the ibigbean iSUP doesn’t show any accessories, we can confirm that it ships with the inflatable paddle board, adjustable paddle, and the attached fins. It also comes with the pump and gauge, bungee, backpack, and repair kit. What are the Shipping Dimensions of the iSUP? It’s packed in a box that measures 31.5 x 15.8 x 7.9 inches. It includes everything you need to get SUPping straight away. The box is small because the SUP arrives deflated. If you’re not completely sold on purchasing your SUP from China, despite certifications, you can always opt for an American brand. This can include the Colorado-based company that produces the Airhead Popsicle Kids iSUP. It’s bright and has almost identical dimensions, but it doesn’t come with a paddle. On sale, the two iSUPS are almost exactly the same price! If you don’t mind spending a few bucks more, the Liquid Shredder Youth paddle board is a soft top SUP that’s also made in another country. It’s manufactured in Peru, one of the world’s most exciting places for water sports. Its svelte figure and sharp design will be proudly bragged about by every kid that gets to own one of these. 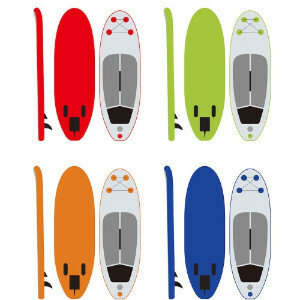 To SUP (sum) it up, the ibigbean SUP is worth considering if you covet the customizable option. You’ll love it, the kids will enjoy it, and together you’ll have a lifetime of SUPping fun!